Ok I admit this Top Banana Challenge was just that a CHALLENGE for me! I am once again using up my stamped images and found this lovely lady there. She is quite a break from my usual style and I thought she looked fashionable so I added the "merci" stamped image I found in my stash also thinking perhaps she is in Paris shopping LOL! I colored them with my Prisma Watercolor Pencils and SU Blender pen. Added some layers of my Paper Place Paper and then mounted them onto the black card front layer which I had run through my Cuttlebug and embossed also. Ribbon is from May Arts and I thought the purple went well enough with my color choice and the black polka dots were a fine addition since I had chosen a black front base. So now swing over to Anna Banana's to get the sketch and give it a try yourself! I think she is chic, and the vintage look is sooo nice! I love the color palette you used with her. It reminds me of a spring evening. 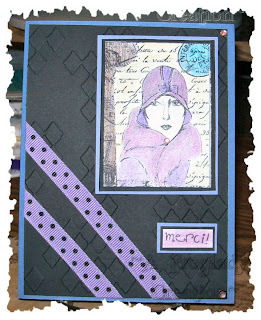 The cuttlebug embossing plate you used is really nice with this one - really pulls it together!